Sunair likely holds the record for shortest-lived airline in history: one day! According to Commuter Airlines of the United States by R.E.G. Davies and I.E. 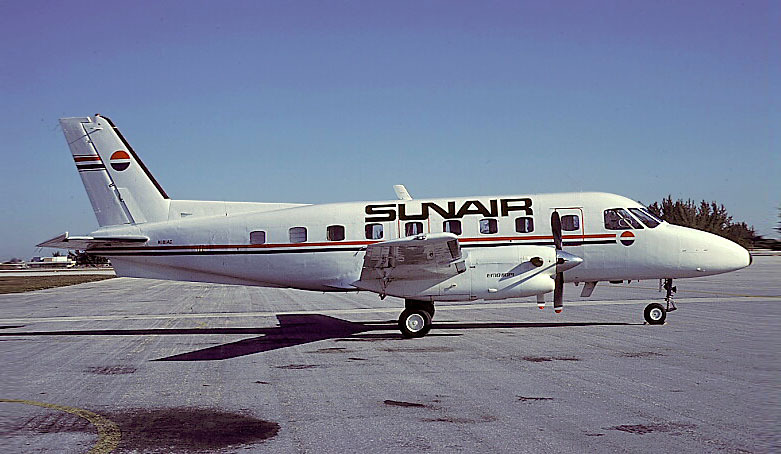 Quastler, Sunair existed for less than 24 hours and managed to operate only one flight. Founded by Fort Lauderdale accountant A. Wayne Lackey in 1980, the airline had grandiose plans to operate a fleet of brand new Swearingen Metroliners to 15 cities across Florida. Timetables were printed in anticipation of the planned first day of service, January 15, 1981. Despite months of advance publicity in which Sunair billed itself as the “Number One Way To Florida”, the company lacked the necessary finances and was plagued by poor planning. The Miami Herald reported that Mr. Lackey hired 400 employees before he bought the first airplane. Lack of financing limited the company to only a single aircraft, an Embraer Bandeirante, not the faster, pressurized Metroliners the airline had hoped for. On the first and only day of service, March 17, 1981, Mr. Lackey reputedly gave the pilot a huge wad of cash and instructed him to fly until the money ran out. Apparently that only lasted for one flight, after which the airline closed its doors, leaving behind debts of over a million dollars. The ambitious destination map of Sunair shows service to 15 Florida cities: Daytona Beach, Ft. Lauderdale, Ft. Myers, Gainesville, Jacksonville, Melbourne, Miami, Orlando, Panama City, Pensacola, St, Petersburg, Sarasota, Tallahassee, Tampa and West Palm Beach. Timetable printed by Sunair in anticipation of service that was to begin on January 15, 1981. The first and only flight operated two months later on March 17.